It’s done, finaly. I ported my Bluetooth Scanning Tool btCrawlerto Android. Sure, some features from the WinMo version are missing, but as time comes I will add more features to it. So what is btCrawler and what can I do with it? 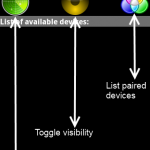 On startup a list of currently paired devices is shown. By touching a device entry a popup menu appears which lets you query sdp services or pair/unpair a device. There are three buttons at the top. 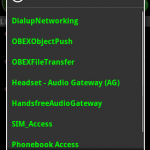 The left lets you scan for devices arround you which are in discoverable mode. After devices have been found, you can again touch an entry and get the popup menu again. The middle button lets you change your device’s discoverable mode and make it visible to others for 300 second or make it invisible again. The right button shows you the list of currently paired devices again. When you press the sdp query option in the popup menu a query for services will be performed for the chosen device and displayed in a popup. I hope you enjoy this tool.